This brightly orange colored fruit comes in many different varieties. 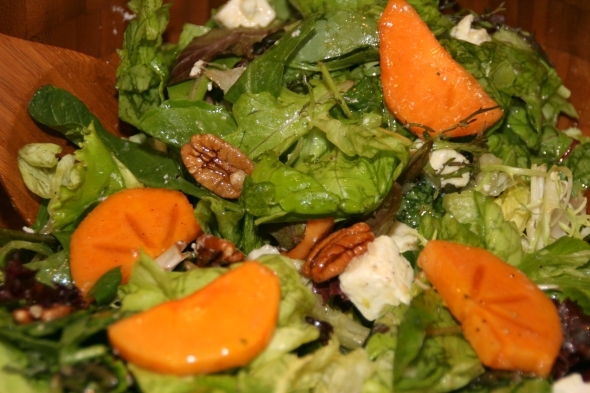 For this salad I use Fuyu Persimmons. They are one of the more popular types that are sold in grocery stores during the fall season. The Fuyu persimmon is best to eat when firm. You can tell it is ready when bright in color and slightly softened. Mix butter lettuce, mixed greens and spinach in a large salad bowl. Add persimmons, toasted pecans and feta cheese. Set aside. Whisk olive oil, shallots, sherry wine vinegar, Dijon mustard, and honey in a small mixing bowl. Generously add salt and pepper to taste. Gently toss salad with desired amount of dressing. Serve immediately.